express common threads that connects us all, Karen’s performances weave together a melodic and lyrical tapestry of celebration, gratitude, love, loss and longing. Currently writing songs for a new CD, Karen’s Highlands Inn performance will feature some brand new material along with many favorites! Most recently Karen’s music has been featured on the LGBT documentary “Driving Equality Across America” by Massachusetts filmmaker and activist Christopher Mason (www.drivingequality.com) Karen performs regularly throughout Northeast including Provincetown, Asbury Park, Rehoboth Beach, Philadelphia and throughout New England. 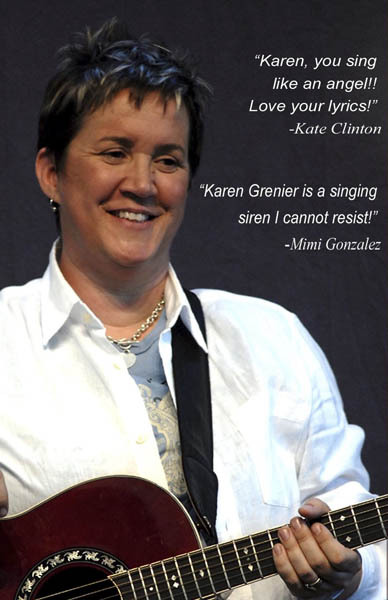 Learn more information about Karen Grenier here.